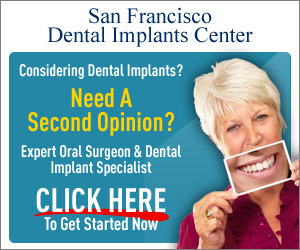 Many patients come to us looking for affordable dental implants, and unfortunately some of them even Google cheap dental implants, San Francisco. 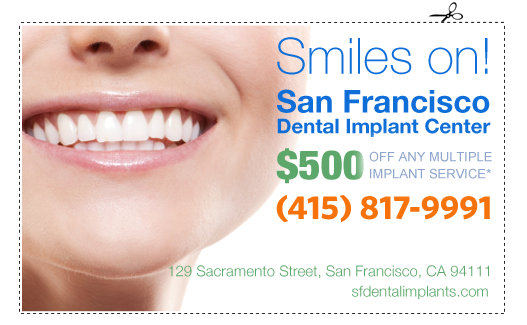 While we do offer coupons for affordable dental implants, and we know that everyone is cost conscious in today’s society, we want to emphasize that we do not provide ‘cheap dental implants.’ Cheap dental implants implies low quality, and our goal is to provide the highest quality, affordable dental implants in the San Francisco Bay Area. One of our goals is to meet with you on an individual basis, and have our Doctor analyze your situation, and give you an assessment of your dental implant needs. Then, we have financing and other options available to get you not cheap dental implants but affordable dental implants that will provide you with many, many years of a great smile! So are we affordable? Yes! 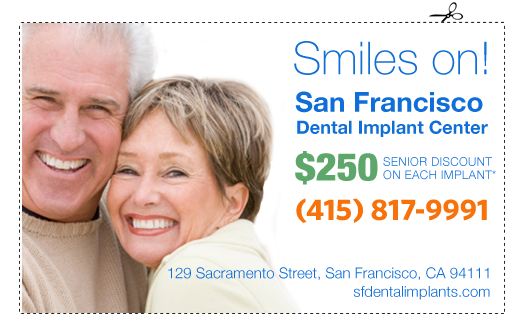 Are we the cheapest dental implants in San Francisco? No! Our goal is high value. 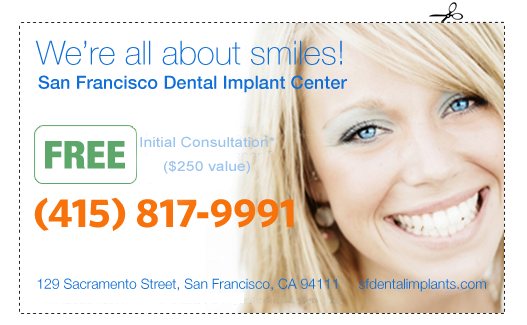 Please call or stop by for a free consultation, and feel free to use the dental implant coupons on this page of that reason!